In which I look at one of my favorite pastimes. I love games. This is my games closet. 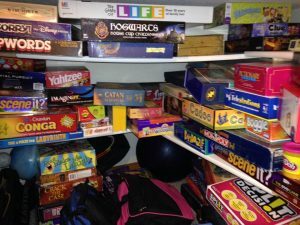 My games closet. Probably could use some organization. I would rather stay home and play games than go out anywhere. Even when we went to Costa Rica, I brought two decks of cards, and on two separate extremely rainy nights, we played canasta. That’s right. I’m forcing my children back into the dark ages. We spend many an evening playing games like Ticket to Ride, Seven Wonders, Settlers of Catan, and the latest ones I’ve tried were Carcassonne and Pandemic. And don’t forget the old stand-bys like Scattergories, Balderdash, Pictionary, and Cranium. I have one game that I love that most people haven’t heard of called Scrutinize. I don’t know why that game didn’t become a classic. It’s great. We play card games and board games. We even play sports games, e.g., volleyball and golf. Robot Guy and I like competition so much that we used to play crazy eights in bed to see who would have to turn out the lights. When I’m alone, I love puzzles. Sudoku, crossword, logic (especially logic), jigsaw; I love them all. My favorite video games are the ones where you solve puzzles. Just recently I subscribed to the Mystery Experience Company and they send a mystery to solve every month. I’ve only done one so far, but it was well done and of high quality. Just my sort of thing. Games Magazine has been an on-again-off-again subscription for me for years. And, yes, I am the person that does the puzzles in the back of the airline magazines. I have yet to try one of the escape room puzzles, but they require a group and that brings up a problem. With the kids out of the house and being such a homebody, it’s basically just me and Robot Guy. In fact many games require more than two people. I’d love suggestions for two person games. My next move is to watch a few of Wil Wheaton’s Table Top videos. I really can’t understand why I haven’t seen those yet.